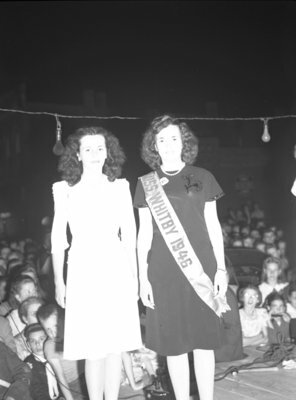 Black and white negative of Miss Whitby, 1946, Darlene Hodgson, and an unidentified contestant (left). Both women are showing wearing sashes. The Miss Whitby Pageant was part of the Kinsmen's Karnival. Miss Whitby, 1946, Marjorie Ruddy, Whitby Archives. A2013_040_1201.